5 minute walk to Levante beach Benidorm. 2 bedroom, sleeps up to 6 persons. Seafront apartment available in Benidorm, 5 min walking from the beach. 30 mins from Alicante airport. WIFI FREE, 2 bedroom, 1 bathroom apartment, sleeps 2/6 people. 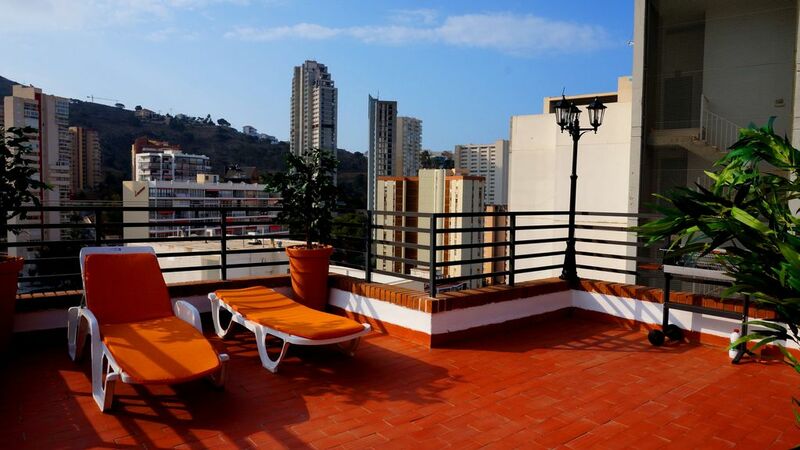 Situated in the Rincon De Loix area of Benidorm, it is surrounded by shops, restaurants and bars. It is a short walk to the indoor market and Casino. Approx 5 minutes walk to the Levante beach (flat area). Apartment are on top (17) floor and has huge open terrace with sun beds, grill and spectacular views to the sea and town. Also apartment has 2 bedrooms 1 double , 2 single beds and 1 double folding sofa/bed. In Apartment You will find big flat (120cm) LCD TV with satellite television and air conditioner. A small kitchen with el. plate, microwave, toaster, blender, washing machine and all cooking utensils. Swimming pool with the shower surrounded by a sun lounge gated area, opens yearly from june to september . A large gated private car parking is available. Public transport is only a 2 minute walk away, making it an ideal choice for your holiday. On arrival we are always there to greet you in person to familiarise with the area and the apartment. The Square is a non-stop all night entertainment meeting place and a short walk for all your nightime entertainment. Plenty of wifi hotspots in the local restaurants some are 24 hours and bars so you can keep in touch with your friends. We are family 38 and 35 y.o. If You want to try live in the sky with spectacular day and night views, You must select this property. We stayed at the property for a week. We were met by Roman who showed us around and explained everything and he was lovely. All of the electrics(including the heating which we needed at night after we'd been out), wifi etc worked fine. We did have a leak in the bathroom but Roman was with us within 20 minutes and sorted it out so you can't ask for any better. The furnishings inside the apartment are adequate for a holiday let but my only slight negative was that the beds were only made up with a sheet and a thin cover. Blankets were provided but they were heavy and not to my taste so we bought duvets, which we left, and were warm and cosy. The terrace is lovely and in January got the sun from 9.30 to 3.30 which is brilliant for that time of year. It was very private and comfortably serviced. The area was quiet at night but 100 metres from the door on Calle Londres there are numerous english bars and they seemed to be busy, all offering food but we didn't try any of them. Our favourite for a night cap though was the spanish snack bar on the corner La Murada it had a lovely heated terrace and a very pleasant barman. Of the restaurants in the immediate vicinity we tried were Casa Jan and Duetto both great, also the China Garden just up the road on the main street, good food and incredibly cheap. Buses to everywhere were at the stops near the indoor market. Overall a great holiday and we would book again.